As I write, ADI is working on three continents to help lions, and other wild animals, who are caged and confined in circuses against their will. Without our action, and your support, these animals will continue to endure a lifetime of suffering. In Peru, we are presently in the midst of a huge rescue mission, emptying circuses of their wild animals. We secured the ban in 2012 and now we are helping to enforce the ban and save the animals! Like our Lion Ark mission in Bolivia, we have many, many lions to rescue, as well as monkeys and other animals. All the animals will be brought to safety – no one will get left behind – and they will be able to live out the rest of their lives in peace, with the companionship of their own kind. In the US, ADI is working to secure a ban on the use of lions and other wild animals in circuses through a new bill, the Traveling Exotic Animal Protection Act (TEAPA), introduced by Congressman Jim Moran. Support for the bill is steadily building but we must continue to push forward to win protection for the hundreds of wild animals that are forced to perform humiliating tricks in circuses and to endure a life on the road, and often brutality and violence. and sign our petition to support the ban. In Britain, lions and other wild animals are continuing to suffer in the circus, despite repeated pledges by Government to bring in a ban. The excuse is a lack of parliamentary time but this is not good enough. Whilst Government stalls on this issue, animals continue to be made to perform, and the risk of new circuses and new animal acts entering the country hangs over us. Please help us keep up the pressure to get legislation passed before the election next year. Thank you for your support and for making World Lion Day count for these majestic big cats who are denied their freedom in circuses around the world. So ashamed that we still have two circuses in Britain using wild animals. The ban comes into effect next year but why not long ago? Have to admit that I didn’t realise this was still going on here until quite recently. I must have thought we are more up to date with animal welfare legislation than we actually are! Hi Denise, unless we work hard to secure the legislation, the ban that was promised will not be introduced next year. Please contact your MP today and urge them to back the bill to be introduced by Jim Fitzpatrick on September 3rd. Thank you. These beautiful animals are meant to be in their own territory not ours. Let them live their lives as was meant to be. Please. You would not want to be locked up in a cage for life, would you? Neither do they. Animals have no part in a circus. Lions are noble animals and should be free to roam in their own environment. We have no right to imprison and beat them into submission thus breaking their spirit. BAN WILD ANIMALS IN CIRCUSES…NOW! RELEASE LIONS TO SANCTUARIES. THEY DO NOT BELONG IN CIRCUSES. Lions should be Born free to live free. No captive breeding, np captive performing cats, no petting parks or walking with Lions, no canned hunting and no trophy importation of lion parts. Stop using wildlife in circuses it’s not right and all the animals are being abused for them to make money. Please stop it NOW! Don’t let wildlife suffer for money. What do we need to do, to rescue these poor lions. It appears to me that humans are in conflict with all wildlife, and all for the sake of making a quick buck, it is sickening to me to see the distress that the animals go through, and i would like to do my bit to help stop this horrific crime a.s.a.p. 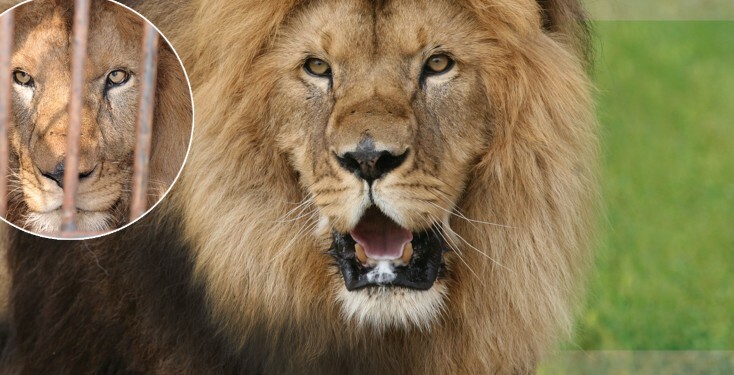 Please help the lions, and all wild animals.To have a life, in peace and freedom. Animals should not be used for our entertainment. All mammals have a very developed limbic system, which is related to the way animals experience emotions. People have found out much new information on the intelligence and emotional life of all mammal species, besides humans, lately. I recommend the movie Blackfish to all. Les animaux n’ont rien à faire dans les cirques, la liberté est la seule vraie vie pour eux ! The use of lions for entertainment is outdated, barbarian , unnecessary and inhumane. To break the spirit and train a lion to do tricks is humiliating for the majestic lion…please in the name of all that is right stop using lions in your circus!!!! Lions should not be in a Circus, they should be treated with respect, They and all animals need a Worldwide Protection in place…this cruelty towards the animal Kingdom MUST END!! Lions belong in the wild, not in circuses and zoos. I’m very much concerned for those beautifull animals sufering in circuses!! Animals are not on this planet for human amusement. I fully support a complete ban on wild and domestic animals being exploited in circuses in the United Kingdom and all over the world. Basta de animales en los circos, basta de sufrimiento y tortura a los animales. NO animal belongs in a circus in any country in this world – these animals are cruelly and abusively treated for so called ‘human entertainment’ and this is unacceptable. I abhor animal abuse in any form and will never ever even consider going to a circus, zoo or any other venue that uses animals. They are not here for human entertainment – they belong in the wild, nowhere else. We like to think we live in the age of reason, that we are civilized but while a single animal is confined in a cage, suffering for the profit of a few and the entertainment of the some, we’re nothing more than stupid beasts without the capacity to respect and appreciate our fellow creatures. They deserve better, we deserve worse for the pain and suffering we cause them. Leave lions in the wild!